How Much Damage Has North Carolina’s Bathroom Bill Done in 1 Year? The law has upended North Carolina politics, but other states are still looking to copy the law. One year ago, the North Carolina General Assembly convened a special session to solve a problem that didn’t exist. Outrageously claiming they wanted to protect women and children from sexual predators, Lieutenant Governor Dan Forest and Speaker Tim Moore—two prominent Republicans who have consistently supported other anti-LGBT legislation over the years—and the legislature’s Republican super-majorities came back to Raleigh in order to block a Charlotte ordinance that expanded nondiscrimination protections to LGBTQ people from going into effect. A 15-year-old transgender boy named Skye Thomson spoke before a committee of state senators, pleading with them not to pass the bill. It would require transpeople to use the bathroom of the gender listed on their birth certificates in public facilities—including in government buildings and schools, which would force Skye to use the girls’ restroom. In the end, Republicans (and eleven House Democrats who voted for the bill) didn’t listen: The hastily written bill was introduced, passed, and signed by Governor Pat McCrory all in one day. At the time he signed it, a public-records request later found, McCrory didn’t even understand the bill. The 365 days that followed have seen incredible backlash against the state, as HB 2 has resulted in costly economic boycotts and partially contributed to McCrory’s loss in November. But despite all of that, the bill remains on the books, and other states are getting closer to copying North Carolina, most notably Texas. Lawmakers and activists are pessimistic that the bill will be undone in North Carolina without the intervention of the courts. Aside from codifying discrimination against transgender people into law, HB 2 also removed the ability of all workers to sue for discrimination in state court (which was only partially restored later in the regular legislative session) and the ability of cities to pursue policies like a higher minimum wage, presumably to placate the state’s business community. The target of the law, however, was undoubtedly transpeople. After HB 2 passed, its effects reverberated beyond North Carolina. Trans Lifeline, a transgender-crisis helpline, reported that the number of calls it received doubled after HB 2 was signed. In the weeks and months after the bill passed, reports came out of cisgender men actually chasing women into restrooms to check their gender. This is all happening in an increasingly dangerous environment. The past year has also brought heightened violence against transpeople. According to GLAAD, 27 transpeople were murdered in 2016, an all-time high since they began keeping those records. Nearly all of them were transgender women of color. Just this week, a 38-year-old transgender woman named Alphonza Watson was shot and killed in Baltimore. “It’s been difficult to watch, it’s been difficult for a lot of transpeople to live through this debate,” Human Rights Campaign National Press Secretary Sarah McBride said of HB 2. In North Carolina, LGBTQ advocates have tried to hit elected officials in the only place where it can hurt: the wallet. In the last year, the state has been barraged with denunciations, boycotts, and cancellations. The NBA All-Star Game pulled out of Charlotte, which the city’s tourism board estimated to be a $100 million loss, and Bruce Springsteen and other artists canceled performances in the state. The NCAA and ACC pulled all tournament and championship games out of North Carolina, no small gesture in a state that lives and breathes college basketball. Some businesses came out against the law as well, most notably when DeutscheBank and PayPal pulled planned expansions from the state and Google Ventures banned investment in the state. In all, The Charlotte Observer recently estimated, the state has lost between $450 and $630 million because of the law. Once November came, the political consequences were severe. On a great night for Republicans nationwide, McCrory became the only governor in the country to lose his bid for reelection, eventually falling to Democratic Attorney General Roy Cooper. And state Senator Buck Newton, who helped the bill get through the Senate and implored a pro-HB 2 crowd to “keep our state straight,” lost his race for attorney general to former Senate colleague Josh Stein, who ran hard against the law. Prior to the election and in the months since, a repeal has been rumored, but has never materialized. The closest attempt came in December, when Cooper attempted to broker a deal where Charlotte repealed its ordinance and the legislature repealed the law. Charlotte did its part, after a couple of tries. When the legislature came back into session, however, Senate President Phil Berger attempted to attach a “moratorium” on nondiscrimination ordinances, and the session was adjourned with no repeal. This week, House Democratic leader Darren Jackson posted images on Twitter of what he said was proposed House GOP legislation to repeal parts of HB 2. 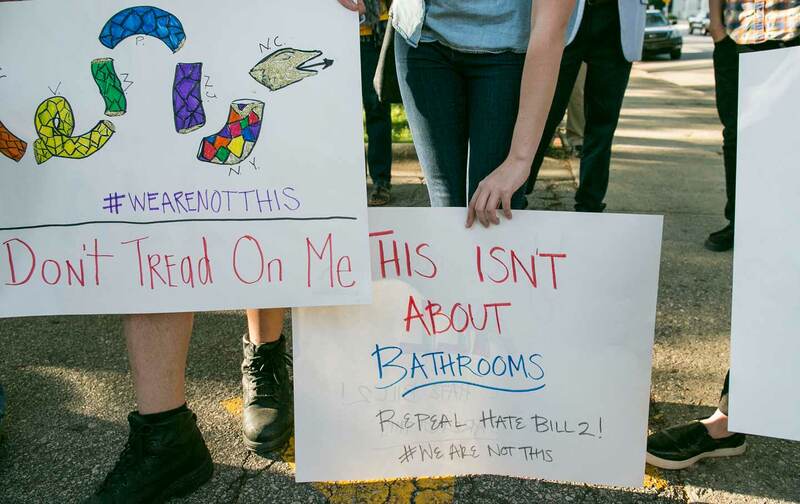 However, the first part of the bill—which prevents transpeople from using the bathrooms associated with their gender identities in government buildings, including schools—would stay, with an amendment in the spirit of Indiana’s original Religious Freedom Restoration Act attached to it as well. Equality NC, one of the state’s most visible LGBTQ-rights groups, immediately denounced the proposal; it’s unclear, however, if this is the final proposal, if Republicans could get it through the legislature, or if Governor Roy Cooper would veto it or not. “I think when I first started this repeal effort, I told you I was optimistic that we could get repeal,” Jackson, who sponsored the first HB 2 repeal bill last year and now leads the House Democratic caucus, told The Nation earlier this week. Recently, Jackson unsuccessfully tried to get a “clean” repeal passed as an amendment to a banking bill. That feeling hasn’t been confined to North Carolina. In February, the Trump administration discontinued Obama-era guidelines for schools to accommodate transgender students, guidelines issued last year as a direct response to HB 2. And in several states, some conservatives have continued to push their states to follow in North Carolina’s footsteps despite the potential consequences. Last week, the Texas Senate passed SB 6, a bill that goes even one step further than North Carolina by establishing civil penalties—against schools, state agencies, or “political subdivisions” that don’t comply with the law, punishable by up to $1,500 for the first offense and $10,500 for the second—when transpeople don’t use the bathroom of the gender listed on their birth certificates. The bill, a priority of Texas Lt. Gov. Dan Patrick, has been strongly supported by Patrick’s counterpart in North Carolina: recently, Forest even went down there and stumped for it himself. In the wake of HB 2, a similar bill in Tennessee failed, but has now returned. In South Dakota, where Republican Governor Dennis Daugaard vetoed an anti-trans bill three weeks before HB 2, the bill has also returned, with a warning from Daugaard that he’ll repeal it again. And in Arkansas, a similar bill has been introduced and is in committee. While some states ponder whether or not to follow North Carolina down a path towards humiliating and endangering its trans community, however, McBride thinks there is reason for optimism in others. Last July, Massachusetts updated its gender-identity protections to include public accommodations. And earlier this year, a bipartisan group of lawmakers in New Hampshire introduced a transgender rights bill, although that effort ultimately failed.